The 3 pilot houses are built in Kalobeyei Settlement on February 2018. It is expected to move to a larger scale construction from beginning of March 2018. Type A uses paper tube as both structure and enclosure. This design utilizes the previous experiences gained from constructing paper tube housing projects and at the same time integrates the locally done construction methods. 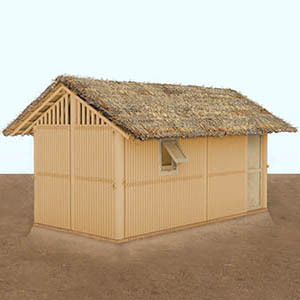 As this does not require specialized skills, this house can be assembled very easily by inhabitants. Also, as women living in Kalobeyei are experts with weaving technique, they have participated in weaving the paper tube enclosure wall. Type B uses modular system of timber walls as the main structure. This system of earthquake-resistant structure was first used in Nepal Project after the large scale earthquake in 2015. As timber frames are all pre-assembled, construction can be done very quickly. Once the timber frames are in place, inhabitants can participate in infilling the frames with bricks for enclosure. Type C uses compressed earth blocks (CEB) as both structure and walls. These interlocking blocks are pressed using local soil mixture nearby the site. This system was also used in Kirinda Reconstruction Project in Sri Lanka.